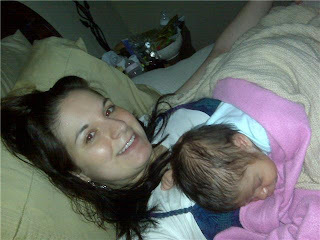 julianna and i just returned from my 6 week checkup at the ob/gyn. this was the first time i've been there with her on the OUTside instead of the INside. it was fun for the nurses, staff, and my doctor to see her. they finally got to check out who they were seeing on the ultrasounds. It was awesome! she was soooo good while i was being "checked out"... everything has healed perfectly and i got mirena. no babies for the soto's for a few years. we want to enjoy julianna as much as possible. we plan to try again for baby #2 when julianna is at least 2 years old. yay for a good visit and a healthy baby! she's 6 weeks & 1 day old! our baby is 6 weeks old tomorrow! the lyrics above just make me want to cry when i look at my little angel. josh and i love julianna so much! she is 6 weeks tomorrow and she's already changing. i notice a new facial expression each and everyday. i love her little smile. it melts my heart! 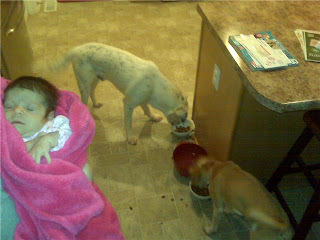 she's also gaining weight... she's got a milk gut! she slept very good last night. i only had to get up one time between 10pm and 5am for a feeding. she even let me take a shower and put on makeup this morning without fussing at me for attention. i think she understood that mommy needed a few minutes to herself. those moments are hard to come by. josh's job is working him very long hours so it's usually just the 2 of us most of the day. i enjoy spending time with her so much and i love it even more when it's the 3 of us. josh holding julianna is the sweetest thing i have ever seen! today i visited my class and finished up the report cards. while i was in the classroom, julianna got fussy and started to scream. one of the students said, "mrs. soto, you were right. you said if we were bad we would make the baby mad. she's mad at us!" too funny! on thursday, i have my postpartum checkup at the ob/gyn. i just can't believe it's already been 6 weeks since she made her debut into the big world. we HAD to get out of the house today. i was getting tired of being at the house all day plus i had a few errands to take care of. -mccrary...a few of my co-workers and my students got to meet julianna. 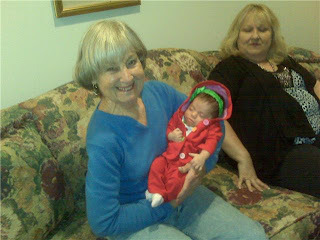 -nana's house and we went with her over to my grandma's house to let her meet her great grand baby girl. i loved getting to see my family and sharing my sweetheart with them! 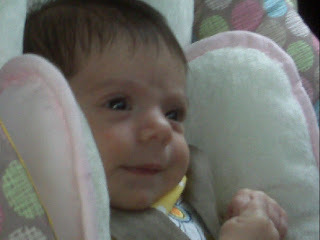 julianna went to the doctor yesterday for her one month checkup. little peanut is growing! she's still in the 10th percentile but that's to be expected due to a low birth weight and the fact that she was delivered 3 weeks early. 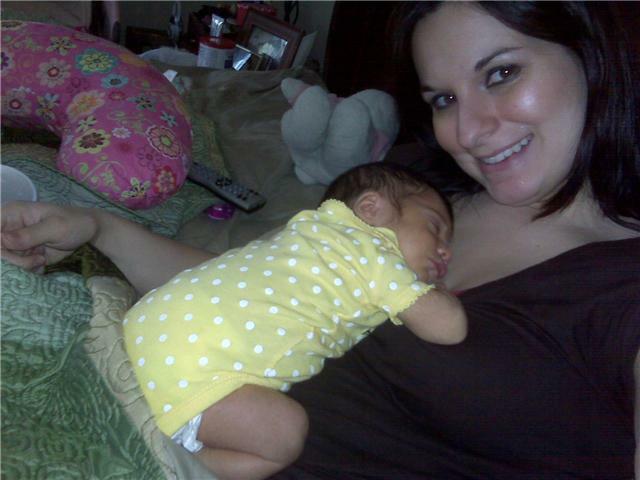 her jaundice has also cleared up so she's not as "tan" as she was when she was born. she's looking more like her mommy as far as skin color goes but she's definitely got daddy's big eyes! the doctor said she looked perfect! we think so too! is one month old today! julianna is 4 weeks old today... so she's been brightening up our lives for 4 weeks! my favorite thing she does so far is when she practices her facial expressions while she's sleeping. she smiles pretty, she pouts by sticking out her lower lip, and she scrunches her forehead to frown. it's too cute! since about a week old, julianna has been rolling over on her tummy time mat. i know it seems crazy... i thought it was crazy, too. josh saw it happen first. i thought he was joking around because i never saw her do it. but on sunday morning, i saw her do it twice! josh lays her down on her tummy and she uses her legs and feet to roll herself over onto her back. amazing! josh is trying to capture the moment on video but of course the little stinker won't perform on film! -bath time...well, she's okay until it's time to get dressed. even with a robe and a towel she screams. she just shivers. josh refuses to give her a bath. he won't do it because the first time we tried it was a disaster. she was screaming at the top of her lungs and josh was convinced that he was hurting her. so mommy gives the baths now. i think i just need to put a heater close to us when we're dressing. maybe that will help. 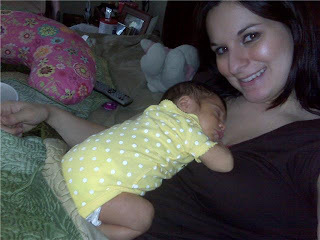 -diaper/clothing changes... she wiggles so much! those sleepers with all of the buttons drive me crazy myself... especially at 3am! i love the zippers! 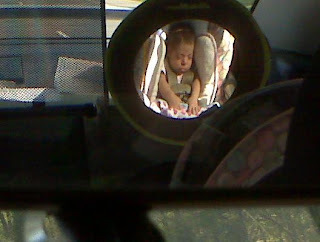 -slow parents... she gets extremely fussy if josh or i take too long to get her bottle ready. i guess that's probably something most parents deal with... an impatient baby! -falling asleep on our chest. after she's burped, she always falls asleep. -riding in the car. she is the most calm and peaceful when we're driving down a bumpy road. -going outside and to soak up the sunshine. we sent out her birth announcements friday. i included the picture of her laying by the window enjoying the sunshine. she loved the warmth of the sun! i need to make a few more announcements so that i can send them to family/friends that i didn't have an address for. my grandmother is in the hospital and i wasn't sure where to send to but i'm sure she'd love to see what her great grand daughter looks like. we've been taking julianna out and about more often now. we're getting used to getting everything ready for her. except today i completely lost my mind and left the house without the diaper bag and had to come back home for it. julianna went to see her daddy at work today. we brought him lunch right before he had to leave to catch his plane. he's in denver, colorado for the week. i wish he was here with us! we were super productive around the house yesterday. we got all of our spring cleaning done. the biggest task was the garage and josh did a great job. both of our cars will fit in there again. woo hoo! 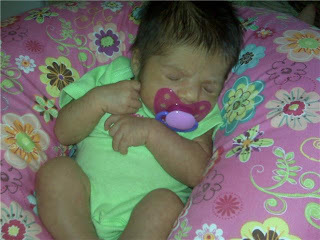 julianna will be one month old on wednesday... time is already flying! we finally got our internet back in action! woo hoo! not really sure what the problem was but the time warner cable guy figured it out for us. i've also been without a car for over a week! josh's car needed work so he has been using my car. we went to pick up his car last night and they had locked the keys inside of it. we don't have a spare because josh lost his whole set of keys and we recently got a new key made... which was $150! josh got a rental so i got my car back. thank goodness! i like having my freedom to leave the house back. our little peanut is 3 weeks and 1 day old today. she can officially wear newborn sized clothing so we have more fashion options now!